Purina Beta Senior Dog Food (Chicken) is a specially formulated complete dog food for dogs aged 7 years and over. 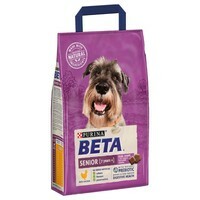 This Beta Senior still has the same great flavours and feel as the regular Beta Adult range, but also contains adapted levels of vitamins and minerals to maintain your aging dog's health and condition, better preventing them from the hindrance that old age brings. Also, with the natural prebiotic chicory, Purina Beta Senior helps to promote excellent digestive functioning and better overall health for your dog. The dual sized kibble adds variety of texture and helps to promote good oral health, keeping your dog in their prime physical condition for longer!